Storylines to Watch in Buffalo - College Hockey, Inc.
Three of last four champions joined by newcomer UMass in the Frozen Four. Cale Makar is the lone Hobey Baker finalist to reach the Frozen Four. Field day – The 2019 Frozen Four field features one first-time Frozen Four participant – Massachusetts – and three teams that won it all in their last appearance at the Frozen Four. Providence (2015), Denver (2017) and Minnesota Duluth (2018) represent three of the last four national champions. Experience counts – In a new-look tournament where 10 of 16 entrants were seeking their first title, three of the semifinalists have experienced recent success. In addition to winning three of the last four titles, they boast the three longest active NCAA Tournament appearance streaks in the nation. Year of the D – In the year of the defenseman in college hockey, the Frozen Four features some elite talent on the blueline. Cale Makar (Massachusetts) is a Hobey Baker finalist, Jacob Bryson (Providence) and Scott Perunovich (Minnesota Duluth) are returning All-Americans, and Ian Mitchell (Denver) was an All-NCHC selection. All rank among the top 25 defensemen in scoring this season. Blank stares – Three teams posted shutouts to advance to the Frozen Four, the most quarterfinal shutouts since the NCAA adopted single-elimination for the round in 1992. The five shutouts in the NCAA Regionals already tie the record for the most shutouts in an NCAA Tournament. The four starting goaltenders in the field have a combined career save percentage in NCAA Tournament games of .958. The two freshmen – Denver's Filip Larsson and Massachusetts's Filip Lindberg – both posted two shutouts in the regionals. Future stars – Nearly two-thirds of all NHL teams (19 of 31) have draft picks in the Frozen Four (25 total), with several other free agent and 2019 NHL Draft prospects in the mix as well. 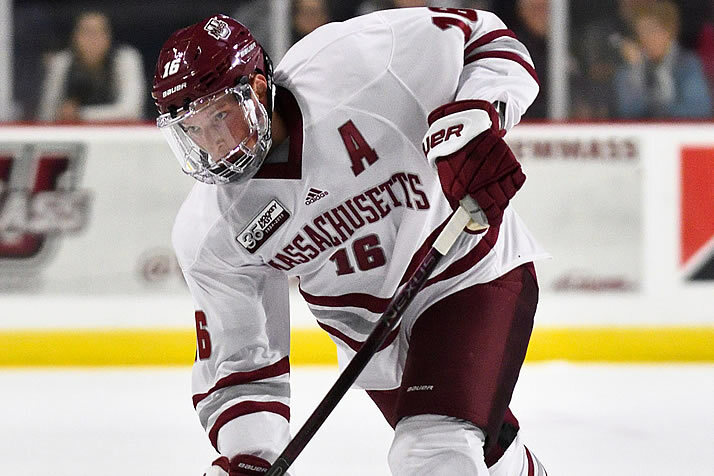 Three NHL first-rounders – Cale Makar (COL/Massachusetts), Jay O'Brien (PHI/Providence) and Riley Tufte (DAL/Minnesota Duluth) – headline the draft picks, while the draft-eligible prospects include Marc Del Gaizo (Massachusetts) and Tyce Thompson (Providence). Providence leads the schools with nine draft picks on its roster, while six NHL teams each have a pair of prospects in the field. Eleven players who played in the 2018 Frozen Four have already signed NHL contracts (and counting). Denver: Five players and head coach Jim Montgomery left from last year's team for NHL contracts, and the Pioneers were picked fifth in the NCHC preseason poll. First-year head coach David Carle and a 10-member freshman class defied those expectations, led by exceptional goaltending from freshman Filip Larsson and sophomore Devin Cooley. The Pioneers started 5-0-1 and were 14-4-2 in mid-January. Massachusetts: The newcomers to the Frozen Four have been among the top teams in the nation all year and earned the program's first No. 1 national ranking in December, just two years removed from a five-win season in head coach Greg Carvel's first year with the program. Hobey Baker candidate Cale Makar leads a talented group of defensemen and is one of 19 freshmen or sophomores on the roster. The Minutemen won the school's first Hockey East championship in the regular season. Minnesota Duluth: The defending national champions won eight in a row after an 0-1-1 opening weekend, finishing second in the NCHC but winning the conference tournament. All six defensemen and goaltender Hunter Shepard returned from last year, and the Bulldogs held opponents to 1.95 goals per game. Providence: The most veteran team in the Frozen Four with six seniors and seven juniors, Providence combined a defense that was top-five nationally with a top-10 offense and trailed only Massachusetts in Hockey East. Senior Hayden Hawkey leads the nation with eight shutouts. Repeat after me – Minnesota Duluth seeks to become the first repeat champion since Denver in 2004 and '05. The Bulldogs have been in back-to-back title games and could become the first team since Lake Superior State (1992-94) to play in three straight championship games. Winging it – The Frozen Four returns to Buffalo for the first time since 2003, when Thomas Vanek led Minnesota to its second of back-to-back titles. This will mark the 11th Frozen Four in New York state, the most in one state since the event moved from Colorado Springs in 1958. The host Sabres have one prospect in the field: Providence's All-American defenseman Jacob Bryson. Nine players on the four rosters hail from nearby Ontario, the most of any province. European influence – A record 110 Europeans played Division I men's hockey in 2018-19, and Europeans have had a profound impact for three of the four teams in the field. Freshman goaltenders Filip Larsson (Denver/Sweden) and Filip Lindberg (Massachusetts/Finland) both posted two shutouts in the regionals. Providence got goals in the regionals from co-captain Kasper Bjorkqvist (Finland) and Scott Conway (England). Denver: Colin Staub, originally slated to attend Air Force before a failed vision test steered him to Denver, leads these four teams with 149 consecutive games played. The senior scored his sixth and seventh goals of the season in the NCAA West Regional. Massachusetts: Niko Hildenbrand, a junior, is one of 10 Californians in the Frozen Four. He is one of only six upperclassmen on a young UMass team that has two sophomores wearing the 'A': Cale Makar and Mario Ferraro. Minnesota Duluth: Senior Parker Mackay nearly doubled his career scoring totals as a senior, leading the Bulldogs in scoring after finishing ninth on the team in points a year ago. He scored three of UMD's five goals in the regional. Providence: Co-captains Jacob Bryson and Kasper Bjorkqvist are both juniors and NHL draft picks. Bryson, an undersized defenseman whose rights belong to Buffalo, was an All-American last season. Bjorkqvist was one of two Europeans in the NCAA to wear a 'C' this season (also Marc Michaelis, Minnesota State). Minnesota Duluth (+11.25), Providence (+10.29) and Massachusetts (+10.13) are the only teams in the nation to outshoot their opponent by double digits on average. All four teams have lost seven games since Christmas, winning 15 (Providence), 16 (Denver, Massachusetts) or 17 (Minnesota Duluth. None of the teams lost more than two games in a row this season. New guy – Denver's David Carle is just the fourth coach in the last 31 years (since the tournament expanded to 12 teams in 1988) to reach the Frozen Four in his first season as a head coach. The last, Brad Berry in 2016, led North Dakota to the national title that year. Balanced attacks – None of the four teams feature a 20-goal scorer, as Josh Wilkins (Providence) and Jarid Lukosevicius (Denver) lead the field with 19 goals each. Eleven players on the four teams have between 15 and 19 goals. Eying 50? – Three players – Cale Makar (48 points), Jacob Pritchard (45) and Josh Wilkins (45) – enter the Frozen Four within five points of the national scoring leaders, who have 50 points on the season. Makar could become the first defenseman ever to lead Division I in points (Ron Wilson led in points per game, but not points, in 1974-75). The last defenseman to post 50 points in a season was Wisconsin alum and current New York Ranger Brendan Smith (52 in 2009-10). Smart guys – Hockey boasts the best APR (Academic Progress Rate) of NCAA Division I men's sports with at least 50 programs in the latest NCAA data, the fifth straight year that men's hockey has led that rating. The team scoring first is 9-3 in the 2019 tournament … Two teams erased third-period deficits in the regionals … KeyBank Center is the 10th NHL arena to host an NCAA game this season. Denver: Denver has won eight national titles; the other 15 schools in this year's NCAA Tournament had combined for seven … Jarid Lukosevicius was the Most Outstanding Player of the 2017 Frozen Four, where he recorded a hat trick in the championship game against Minnesota Duluth … Juniors and seniors accounted for every goal and seven of nine points in the regionals … The least penalized team among the four (10.05 PIM/game). Massachusetts: The Minutemen were picked sixth in the preseason Hockey East coaches' poll … The Minutemen had the top sophomore class in the country, posting an NCAA-leading 75 goals, 119 assists and 194 points, 19% more points than the next-closest school (Penn State, 163) … Makar is the lone Hobey Baker finalist to make it to Buffalo … UMass is the only team in the nation that never lost consecutive games this season … Ranks second nationally with 54 third-period goals. Minnesota Duluth: The Bulldogs' two previous championships came in St. Paul … Scott Perunovich and Hunter Shepard were members of last season's Frozen Four all-tournament team … The top faceoff team (52.2%) among the four … Justin Richards's father, Todd, is an assistant coach with the Presidents' Trophy-winning Tampa Bay Lightning … Enters with the longest active winning streak (six). Providence: The Friar roster features representatives of 13 states, two provinces, England and Finland … Josh Wilkins has 10 goals and 16 points in his last nine games … Providence fell behind, 3-0, in its first round game but scored 10 straight goals to advance from the East Regional … The Friars are the ninth No. 4 seed to reach the Frozen Four in the last 12 years; they were a No. 4 seed when they won in 2015.